Planning education can be tiring, draining and confusing. Especially if you plan to get your degree from a foreign land. There will be different questions that will strike your mind a number of times, from what course to opt for to the accommodation questions. We at Global Strides will help you giving the best guidance and answering to all your queries about the entire Study Abroad process. From choosing the country to the post landing services. After calculating your prior education and evaluating all the necessary documents our experienced counselors will guide you in the best possible way with the best and most fruitful options. Global Strides works on well-planned strategies that will help you getting the maximum chances of success. While planning to study abroad, choosing a country is the initial and one of the most crucial steps involved in having an international degree. Our best counselors at Global Strides help you with the complete guidance for what country will be the most suitable. Post a proper assessment, providing you complete information on the culture, demography, people, languages and the lifestyle. Education is well-taken when you are surrounded by a comfortable habitat, same is what we try providing you at Global Strides. Our expert counselors at Global Strides, after a proper assessment of your academic history help you identify the most suitable course which further help improving career. We together work to help you get into the best course that will improve the career outcomes in the future. Global Strides is updated with the latest courses and university guidelines around the world. Our counselors will make surethat you are guided with the best and most relevant course options. Planning your education abroad can be a confusing process. For different experts will have different advices to give and internet makes it much more confusing for you. Global Strides therefore has come up with simple, time saving and efficient process that includes end to end knowledge about Study Abroad. Understanding the students requirements and delivering the apt and required information accordingly is one of the the key roles that our counselor plays. From guiding you about the course and country to the post landing services. You ask- We have it all under one roof. Helping you to unlock your dreams is what we are trained and determined for. Our expert finance advisors at Global Strides calculate for you an expected cost of study, living and staying expenses with the total fee structure for the respective university or college. Also, you can get the required details on the scholarship opportunities and assistance for financing your education. Our experts will consider your interest for the required investment to be made while providing you with the details for country, course and university. Safety is another important aspect when it comes to surviving in a foreign land,Family is the most worried when you are away from them, living in a foreign land all by yourself. 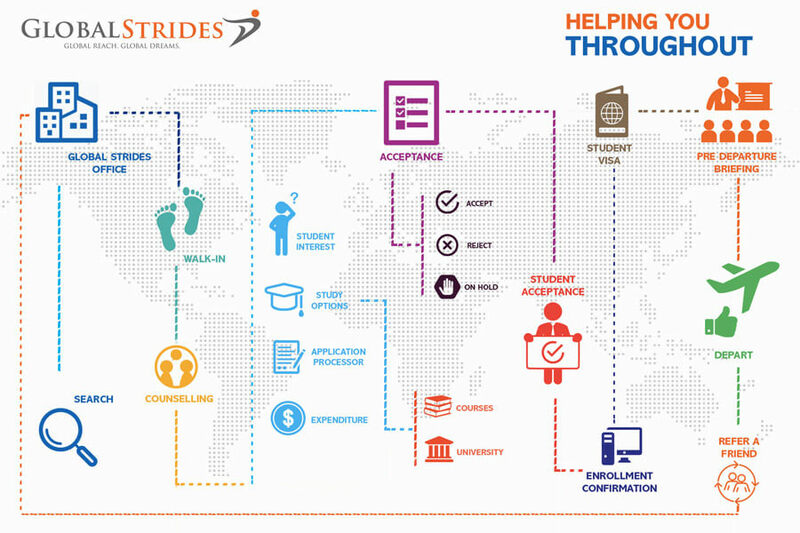 Global Strides gives you options to be associated with more than 300 education institutions, established in the world’s safest countries for education, and recognized by UNESCO. We cannot deny that a safe and sound environment during the studies help you continue a stress free education while enjoying the foreign life as well. Our expert career counselors help you understand and have a better picture for how you can attain job opportunities after completing your course abroad. You can also gather information for the same while studying. Also, it is important to keep away from fake agents who might promise work post study. At Global Strides, our expert counselors advice and guide you about all the work opportunities during and after completion of studies. Different security reasons across the world cause a lot of countries to change their visa regulations constantly. Most likely, it is difficult to be updated of all such visa provisions and seeking a external help becomes important. Our team of experienced visa officers will help you with the most updated rules and regulations for every study abroad destination. High visa success rate matters on the information provided to the student and the process thereafter. Global Strides is determined to deliver the best for students. Finding the correct type of accommodation abroad can be quite challenging task, especially when you want comfort but also comes with a pocket friendly price. Different countries have different options for accommodation availability fitting well with your finances. But this might not be enough. Choosing the accommodation that suits well with the transport and work distance is essential as these small savings can do wonders and also prove as some amount of the college/ university fee. Our advisors guide you with sufficient information about the best suitable accommodation. Due to high variations in air fare, choosing the correct airline for travelling saves a lot in the entire study abroad cost. Choosing a suitable airline is an important point and not to be ignored. Also, using a convenient and affordable local transport can lower down the entire travelling cost. This can help in more savings while investing in the education. Our expert advisors for the same at Global Strides provide you with detailed travel information to have a fruitful study abroad mission.